We have 0 member(s), 1 spiders, 46 guest(s), and 0 anonymous users online. There hasn't been much activity of any kind here for some time, but a few of us still look in from time to time. 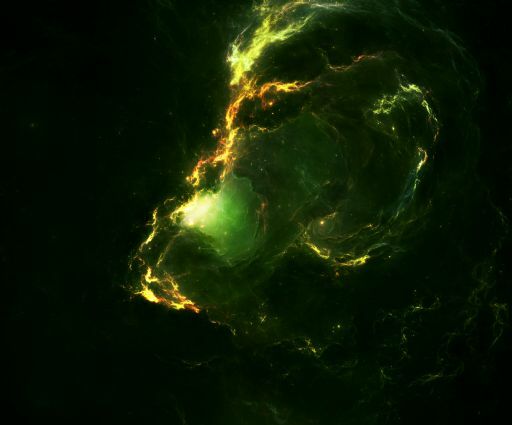 An interesting nebula. It looks almost like a head, seen in profile. The bright light is the mouth, the orange lines above it are the nose and eyes, and the bright curves to the right make good ears. It reminds me of some of the brighter star-forming regions, with a molecular cloud to the left, the new stars blowing holes in the cloud, and reflection nebulae behind them. Very nice! Was this done using Apophysis? Nice to see this place still going. I really like this image, especially the way the ligher parts flow. Immortality is a lonely existence in a universe devoid of life.